Electronics trade shows and exhibitions play host to all manner of announcements. Some pertain to products that we've been trailing for months prior to the unveiling, while on other occasions, companies surprise onlookers with something new and audacious. Alcatel's showcasing of the OneTouch Xess tablet back at last year's IFA caught everyone unawares, thanks largely -- if you'll excuse the pun -- to the 17-inch display. With a slew of quirks that one might not find elsewhere, it's an interesting concept, and one that will hit shelves in two weeks' time. As much as it may seem, the OneTouch Xess is not simply designed for giant human beings. 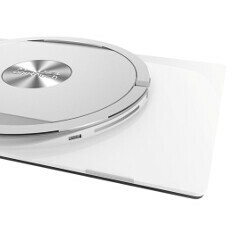 Rather, Alcatel sees the device as a 'kitchen tablet'; a central hub that can be utilized by the entire family. The accompanying features, like bundled Nickelodeon content and a free IP camera for keeping a check on other rooms of a household, suggest that the OneTouch Xess is a slate is geared towards those with youngsters around. Though it has its practical aspects, it's an entertainment device at heart. Along with the pre-loaded media content, the large panel is a full-HD offering, and Alcatel has teamed up with JBL Audio to deliver a dual, 3-watt speaker experience. If you're keen to get your hands on the beast, it will be available from April 22nd at a $499 price point. All questions of need if priced right this could be great. why not? there are still lots of 17" monitor with 1080p resolution.. even cintiq 22HD is using 1080p..
hell there is tons of 23in 1080p monitors that are used daily, to great effect too. Im still using 1920x1200 24" monitor and there are alot others 20-27" monitor that have 1920x1080 resolution peoples are using. Nothing wrong with FHD on 17". Only fail here is u. Actually, it also depends on the viewing disance. Your 27" monitor is generally farther away from your face than a tablet you hold in your hands. PPI don't mean everything when considering a display. I don't mean that 17" FHD is a right or wrong choice. I have no idea how I would hold and use such a behemoth of a tablet, so I have no idea whether or not pixel density will be an issue when using it. The only thing I want to point out is: just because you're completely fine with a 20-27" FHD monitor does not mean that you will necessarily be content with a 17" tablet. One will need to try it in real life before judging whether or not it will be an issue. I've seen this already somewhere..
How is it a fail? The majority of all HD content is 1080p, and a lot of TV channels broadcast in 720p still. So you have TV's much larger than 17 inches and they're all 1080p. Come on, use your head. I guess they wanted to keep the price down but at this point I do not see buying any device that is not capable of 4K resolution. My next TV will certainly by 4K, my cell phone is 4K so I would want a 4K tablet. There is more and more 4K content available and many devices upscale. I get what you're saying, but you won't see 4k in an offer offbrand device (like Alcatel, ZTE, Huawei) for a cheap price point for a couple years, if not 5+ years from now. 4Keep at 17 inches would be perfect, especially when the viewing distance is ~6-15 inches away from your face. 4K is unnecessary at this point. How many channels broadcast in 4K? Like, 2? And 4K content is extremely expensive. It's wasted tech at the moment. It's nice to say you have a 4K TV, but what's the point when everything is 1080? Considering DirecTV is launching its 4k HD Ultra channel with the Masters golf tournament I think the time is here. Most cameras now shoot 4K so you can make your own.